Karcher’s walk-behind sweepers are ergonomic and easy to operate. They sweep efficiently without causing too much dust. These machines are perfect for caretakers, tradesmen, contract cleaners and those seeking quality professional equipment. 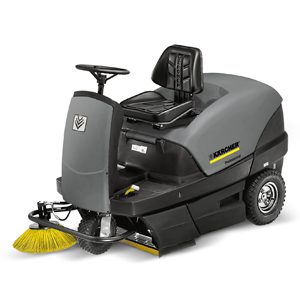 Karcher offers a range of ride-on sweeper vacuums. Comfortable, economical and efficient, they’re made with innovative technology, though easy to operate. Best for medium to large areas.